Here are original orchestral works written as early as 1929 and as late as 1958. The otherwise unnamed Overture (what chance does it stand with that title) was the sole work written by Martinů in 1953. It has a Handelian weight but this is leavened by the buoyancy of the Fourth and Fifth Symphonies. 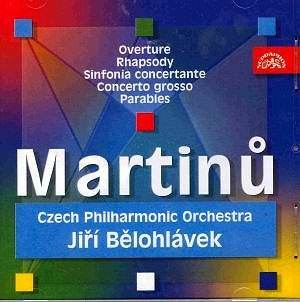 Full orchestra are matched with a concertino of seven solo instruments (flute, violin, cello, oboe, violin 2, viola, cello 2) in Martinů's favoured �Concerto Grosso� confection - of which more later. It has the feeling of a sumptuous Bach transcription by Elgar or Stokowski. �Rolling, raw and rollicking� best describes the wild and woolly Rhapsody for Large Orchestra. It has something of Ibert, Satie (definitely not the Gymnopédies) and Honegger about it. An explosive, active symphonic movement, it was originally intended for dedication to Koussevitsky. It is closely aligned with La Bagarre and Half-Time. Only three years later came the four movement Sinfonia Concertante for two orchestras. The touching andante aside, this is a work that continues the style of the Rhapsody pretty well without seam or gear-change. The work chatters and chirps, alive with rhythmic invention and a scattiness I associate with Prokofiev's Love of Three Oranges. The Concerto Grosso's middle movement powerfully points a bony finger towards the doom and foreboding of the Concerto for Double String Orchestra, Piano and Timpani (still best heard in Sejna�s now forty year old recording on Supraphon). Otherwise the Concerto Grosso occupies the same circus ring of spiffing frou-frou levity as the Sinfonia Concertante. Parables is the highlight of this generously timed collection. Its philosophical track is dictated by Antoine de Saint-Exupéry's novel Citadelle. The three movements are andante pastorale (allegories of sculpture), poco moderato (Garden) and poco allegro (Ship). It is in stylistic touch with the Sixth Symphony whose buzzing insect clouds are evoked in the final movement. The first movement takes a Debussian brush to a theme that seems to have been inspired by the start of Sibelius's Fifth Symphony. The works of the Parisian years (or some of those works) can be a bit of a trial but the Overture and Rhapsody make substantial amends. As for the Parables this is a work that belongs with the symphonies. Fine notes and glowingly vivid recording quality from the late 1980s.